This post was written by contributing sports editor Sean Hurd. 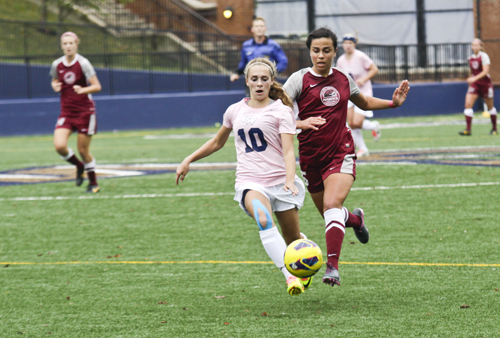 After handing La Salle their first Atlantic-10 conference loss in three seasons, the Colonials were unable to find the back of the net Saturday afternoon as they were shut out 2-0 by Saint Joseph’s. The Colonials outshot the Hawks 15-7, but struggled to capitalize on their five shots on goal. It was a matter of inches, as GW could not capitalize on their momentum from Friday’s big win. In the 20th minute, senior midfielder Jane Wallis was able to create space from her defender and powered a shot on goal, but the ball caromed off the top crossbar. Running in on the play was sophomore Kristi Abbate who attempted a rebound shot on goal which slowly cut left out of play. The Colonials next scoring opportunity came off the foot of junior midfielder Nicole Belfonti, who after crossing over her defender, lined a shot on goal that banged off the side crossbar. St. Joe’s, unlike GW, was able to convert its opportunities in front of the net. After beating the Colonials backline inside, Mo Hawkins scored her fourth goal of the season on a point blank shot past GW senior goalkeeper Nicole Ulrick in the 24th minute. The Hawks’ second goal came on a corner kick, where Ulrick admits she made a mistake under the crossbar by stepping forward when she shouldn’t have. The corner taker, Shannon Mulvey was able to curve a shot, which was credited as an own goal, after aGW player struck the ball as it crossed the plane. GW, who Barnes said played fatigued after Friday’s hard fought shut out win over La Salle, saw the game run out of their reach. Despite a strong second half showing where they held the Hawks to just two total shots, the Colonials could not recover from the first-half deficit. Despite the loss, Barnes remains optimistic about the state of her ballclub after what they accomplished this weekend. For Ulrick and the rest of her team, it’s a matter of learning from every game and then preparing for the next matchup in a conference where GW is in position to grab a high playoff seeding.